Making your own sushi is not as scary as it sounds – in fact, it’s really simple. To serve: Pickled ginger, soy sauce and/or wasabi paste (optional). 1. 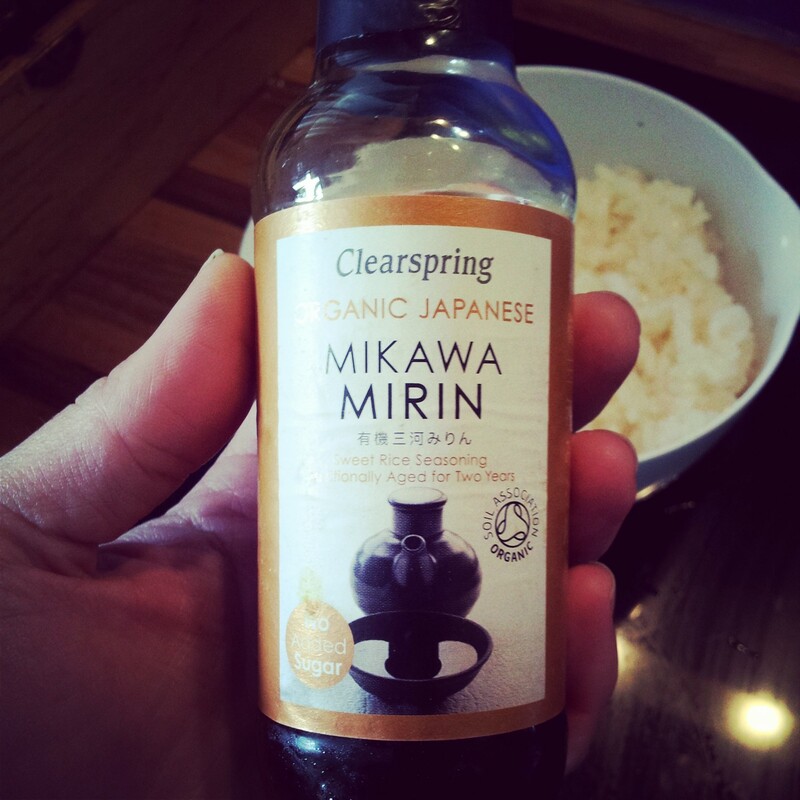 To prepare the rice, put it in a medium saucepan and cover with 380ml of water. Bring to the boil, then reduce the heat to low, cover and leave to cook for 20 minutes (set a timer so it doesn’t get forgotten). When the rice is cooked, drain if necessary and transfer to a bowl. Gently fold in the rice vinegar, salt and mirin and leave to cool. 2. While the rice is cooking/cooling, prep the vegetables. 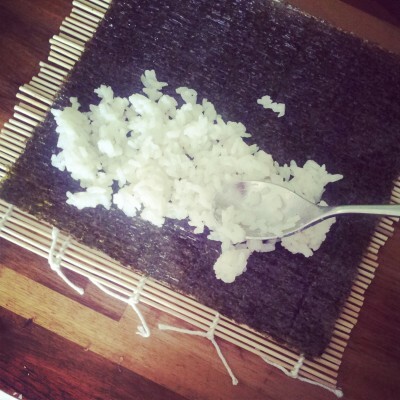 Once the rice is cold, get ready to roll: place one sheet of nori onto a sushi rolling mat, shiny side down. Spread a thin layer of rice over it, leaving a 2cm border along the far edge. 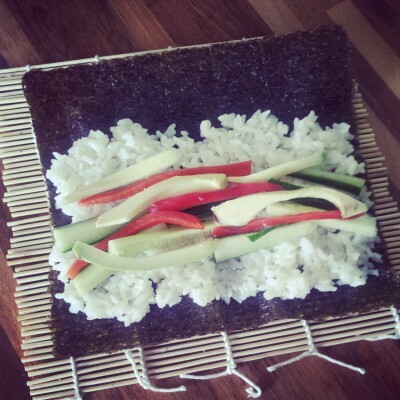 Arrange a selection of vegetables on top of the rice, running the same way as the bamboo of the sushi mat. 3. 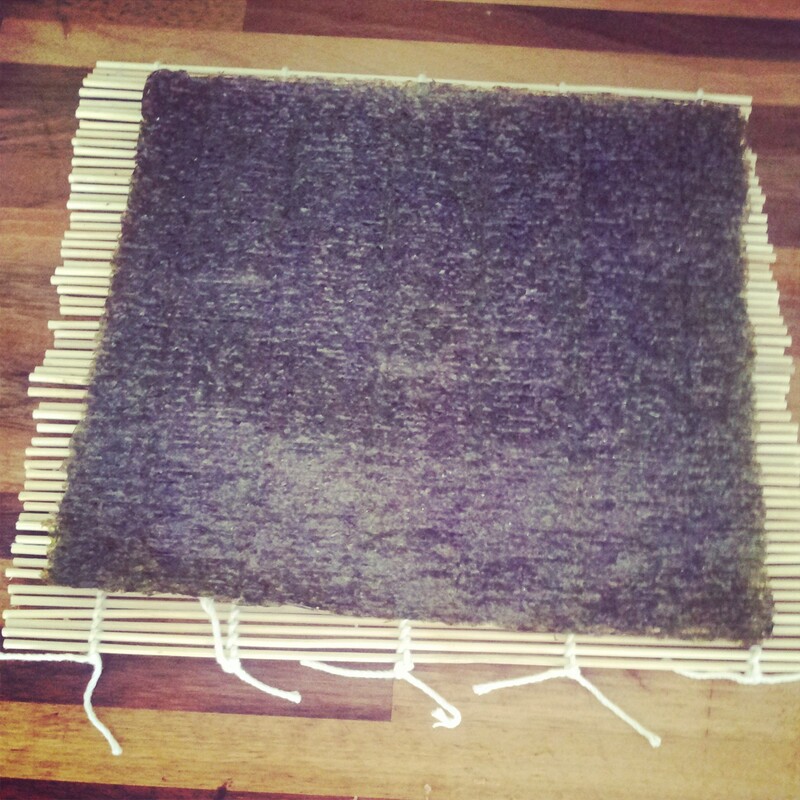 To roll, the mat to carefully lift the edge of the nori nearest to you and roll it away from you, tucking it in as tightly as you can. To seal, squeeze the the sushi roll. still wrapped in the rolling mat, along its length (if necessary you can moisten the far edge with a little water on your finger tips to seal the roll together). Repeat with the remaining nori sheets, rice and vegetables. Wrap tightly in clingfilm and chill in the fridge until required. 4. 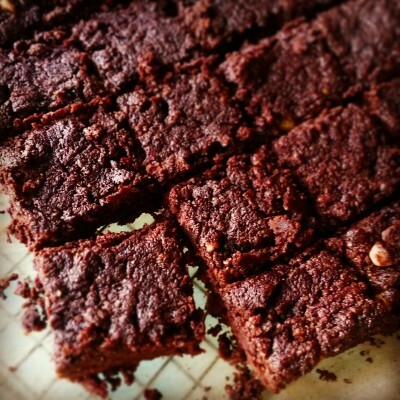 To serve, cut each roll into slices about 2.5 cm thick and arrange face up on a plate. 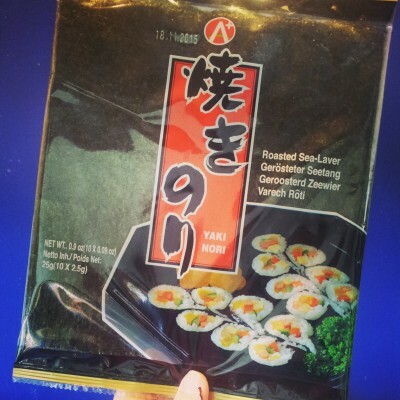 Serve with pickled ginger as an accompaniment, and/or with soy sauce and/or wasabi paste for dipping. Notes: you can boost the protein content by including some firm tofu (cut into matchsticks); for a lower fat option, omit the avocado. The Sushi nori, sushi rice, mirin, rice vinegar, pickled ginger and sushi rolling mats are all widely available in UK supermarkets or health food shops, but the cheapest place to buy them is generally your local oriental supermarket, if you have one near you. 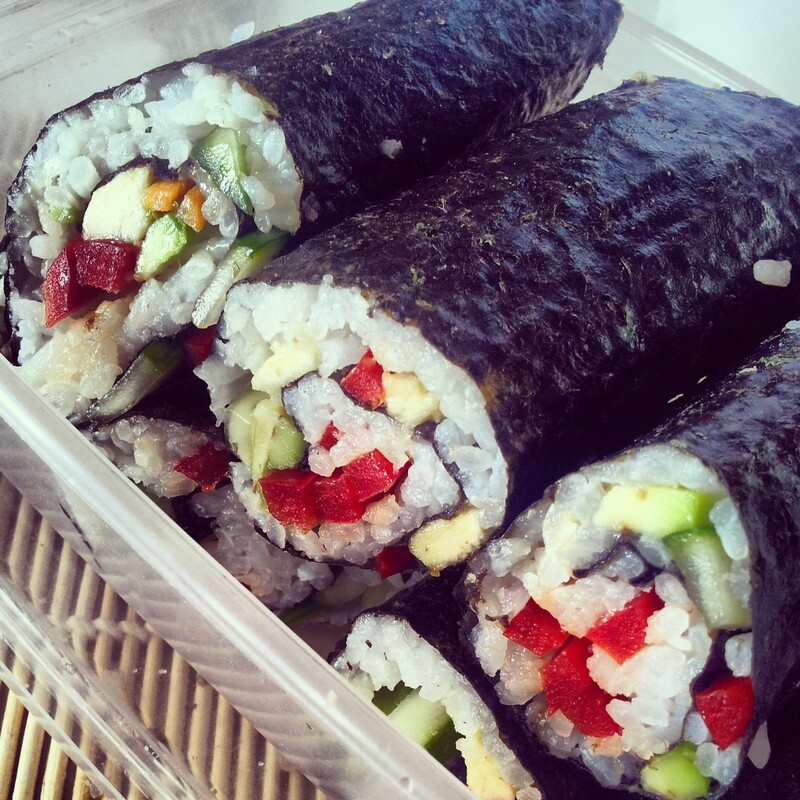 Making your own sushi really isn't as scary as it sounds - in fact, it's very simple. To prepare the rice, put it in a medium saucepan and cover with 380ml of water. Bring to the boil, then reduce the heat to low, cover and leave to cook for 20 minutes (set a timer so it doesn't get forgotten). When the rice is cooked, drain if necessary and transfer to a bowl. Gently fold in the rice vinegar, salt and mirin and leave to cool. While the rice is cooking/cooling, prep the vegetables. 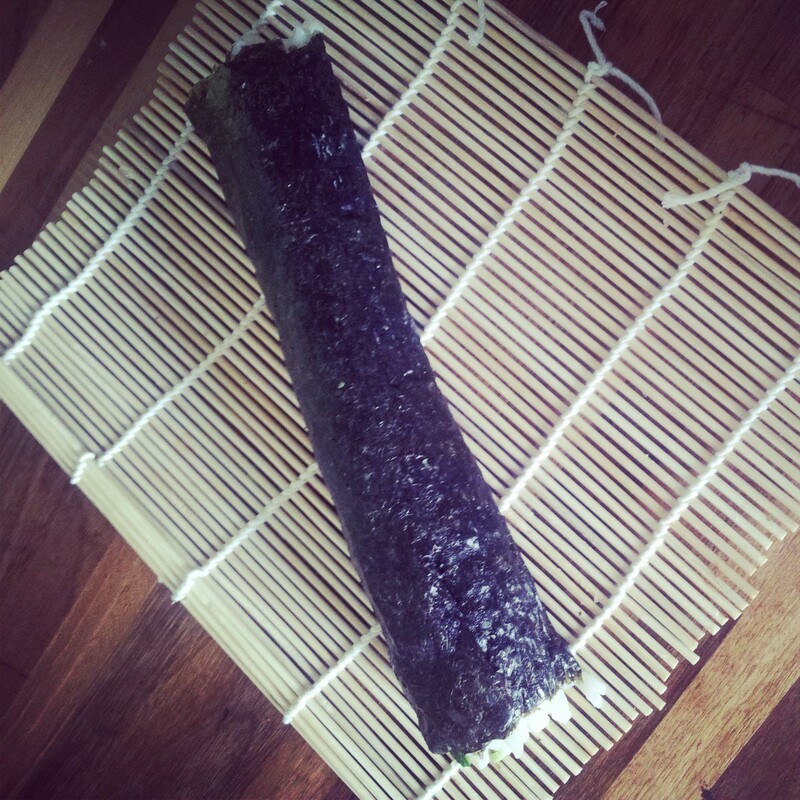 Once the rice is cold, get ready to roll: place one sheet of nori onto a sushi rolling mat, shiny side down. 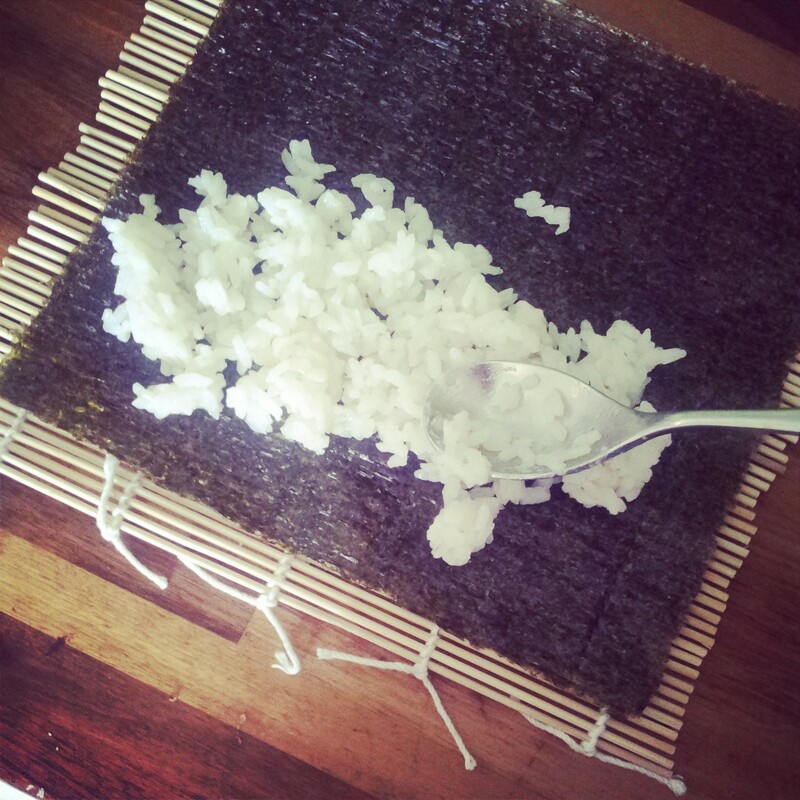 Spread a thin layer of rice over it, leaving a 2cm border along the far edge. 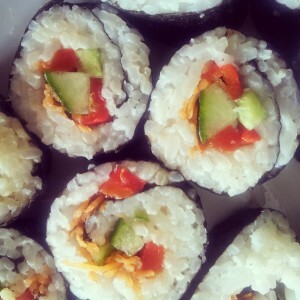 Arrange a selection of vegetables on top of the rice, running the same way as the bamboo of the sushi mat. To roll, the mat to carefully lift the edge of the nori nearest to you and roll it away from you, tucking it in as tightly as you can. To seal, squeeze the the sushi roll. 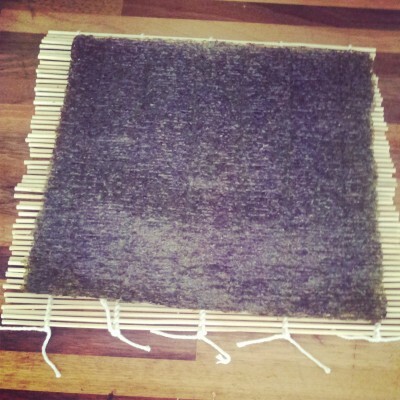 still wrapped in the rolling mat, along its length (if necessary you can moisten the far edge with a little water on your finger tips to seal the roll together). Repeat with the remaining nori sheets, rice and vegetables. Wrap tightly in clingfilm and chill in the fridge until required. 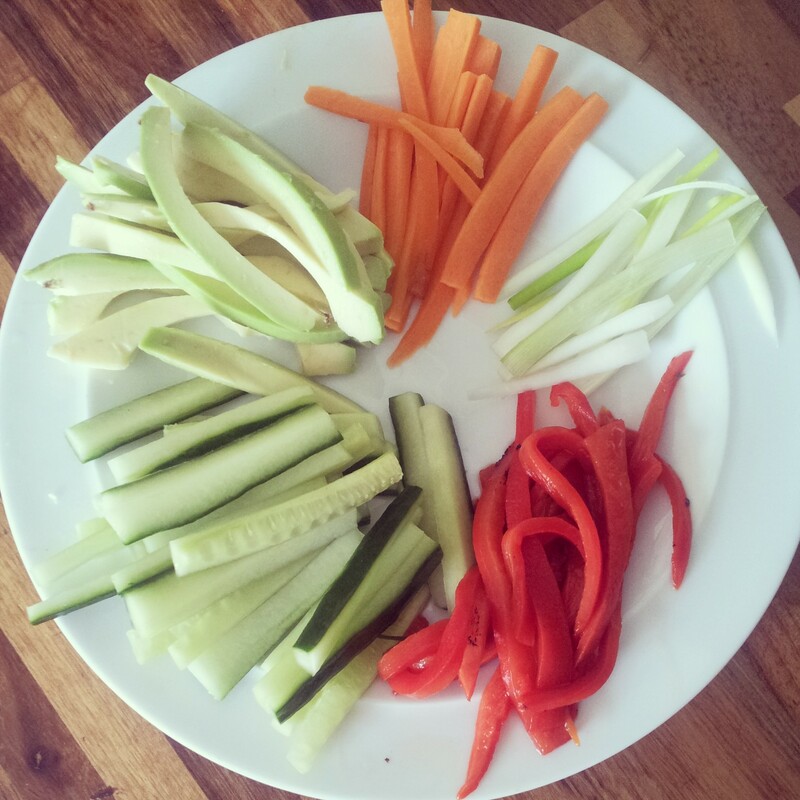 To serve, cut each roll into slices about 2.5 cm thick and arrange face up on a plate. Serve with pickled ginger as an accompaniment, and/or with soy sauce and/or wasabi paste for dipping. Notes: if you wish, you could boost the protein content by including some firm tofu (cut into matchsticks); for a low-fat variation, omit the avocado. 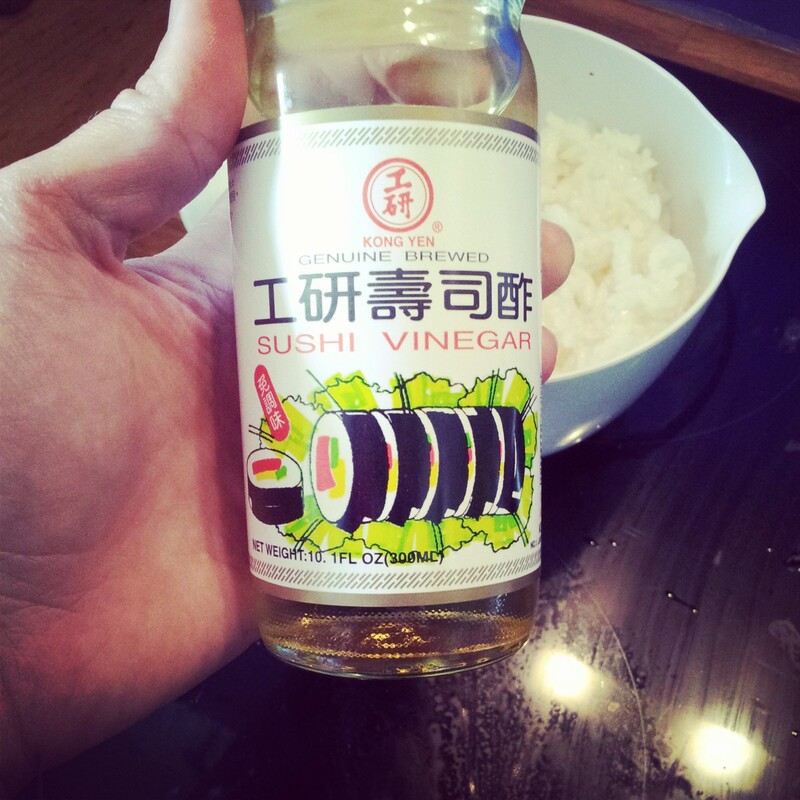 The Sushi nori, sushi rice, mirin, rice vinegar, pickled ginger and sushi rolling mats are all widely available in UK supermarkets or health food shops, but the cheapest place to buy them is likely to be your local oriental supermarket, if you have one near you.